Posted on September 22, 2012, in haiku, Haiku Heights, Mexico, September Heights, Straight Out of the Camera Sunday, Zacatecas and tagged haiku. Bookmark the permalink. 42 Comments. Lovely take on the prompt !!! The desert area looks a bit of sepia sand, not colorless but dry. 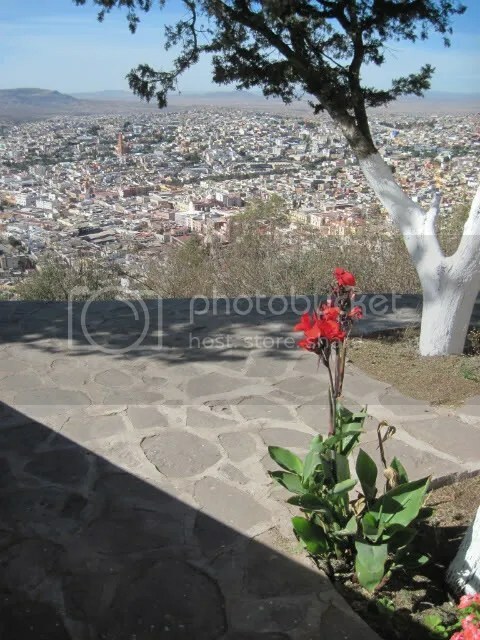 The red flowers atop the hill overpower the scene and become the new focal point for both human and hummingbird alike. Nice vista! Lovely, colorful shadow shot for the day and a great shot of the desert as well! Have a great weekend! Great take on the prompt. I really like this one. Tremendous. You really understand nature. And those red blossoms , so provocative and seductive , who could resist? SO true… any bloom is such a heaven for humming bird… and when the blossom is at the most unexpected random place it’s a blessing in itself!!! Love the whole thought!!!! I enjoyed this way of taking the prompt too – it works very well. “humming bird heaven” indeed. What a beautiful setting. How could any hummingbird resist such a lovely spot? Very nice. Hummingbirds are smart flying high away from the busy cities. I bet the little hummers do love those beautiful flowers, but I hope they take in the amazing view too. Breathtaking! Would be heaven for me too. fantastic scene accentuated by the red flowers! Such powerful light defining even distant detail! And the touch of red adds such a burst to the photo! Beautiful! I like the picture of blossoms looking over the streets! What a stunning shot – so spare on the balcony and the view of the city below. Great sadows and haiku! A beautiful photo of a lovely spot. Should be in a travel brochure. Lovely response to the prompt! What a great shot and perspective…really stunning. Both! They worked for a previous prompt, and they work for “hummingbird.” Observant you! Great shot. I love the shadows and stillness of the afternoon in desert climate. Beautiful. Lovely lacy leaf shadows and a wonderful pop of red that the hummingbirds would love (and so do I). — thank you for sharing and for hosting. I like your take on the prompt. The flowers are beautiful, so I can see why the hummingbirds are attracted to them. Beautiful, the height of the city! Thank you for visiting me too. How smart hummingbirds are to find nectar so far up!